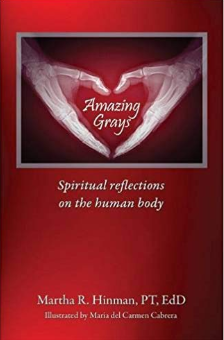 “Amazing Grays” describes and reflects on the anatomical and physiological complexities of the human body and provides a spiritual perspective that will lead people marveling at God’s creative power. With great love for anatomy and physiology, Martha R. Hinman expresses how marvelous the human body is. By giving out explanations of the different body parts, readers will come to love what they have and be proud of it. They too will be informed of its proper functions and its needs to keep going. Along with that, a spiritual sense of emotion will wrap around the mind as readers realize how God is so kind and giving that He not only gave people life, but He also gifted them with physical bodies with organs that work together to keep them kicking and enjoying the world we now live in. With the metaphors used in the book, readers will be able to reflect and realize, wonder, and stay in awe of such a beautiful creation. With the Bible as a main reference, the book portrays the importance of the body as it is a vessel for the soul and the very being of man.